On 24 September, the latest batch of US tariffs, starting at 10% and increasing to 25% at the end of the year, was imposed on $200Bn worth of Chinese goods. These latest tariffs are in addition to penalties implemented earlier this year on $50Bn worth of Chinese goods. Taken together, it means roughly half of the products that China sells to the United States each year will be hit by tariffs. In response, China announced its own duties on US goods worth $60Bn, starting on the same date. The Chinese government said the new tariffs will be levied at rates of 5% or 10%, depending on the product and will affect more than 5,000 US goods including meat, nuts, alcoholic drinks, chemicals, clothes, machinery, furniture and auto parts. Other key US trading partners, including the European Union, are currently in talks with the US administration to avert the implementation of reciprocal tariffs on a broad range of products. On September 30, NAFTA negotiators finally managed to reach an agreement on a new trade deal, the United States, Mexico, Canada Agreement (USMCA). This is having a direct impact on current and future corporate profitability, growth and earnings. Optimize supply chain and operations efficiency. 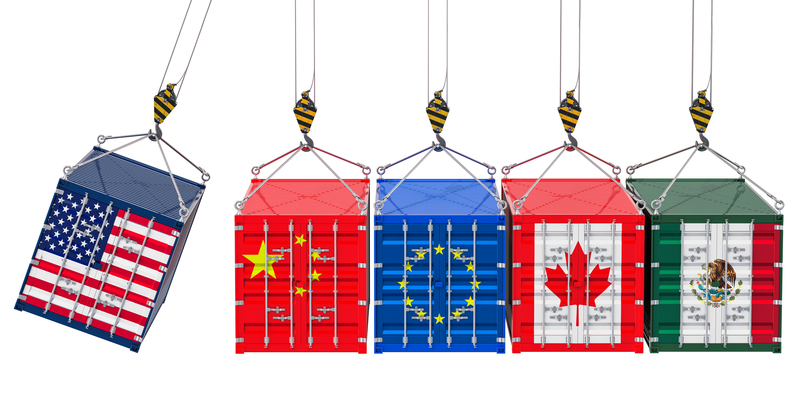 Irrespective of the global trade war, there are still significant opportunities for companies to drive out cost, release cash and enable growth in the end-end supply chain. Taking a holistic, Total Value Optimization™ approach can help clients implement a synchronized buy-make-move-fulfill supply chain and operations optimized to deliver the greatest value to customers and investors at the lowest cost to business. This approach drives measurable value in months not years. Improve supply chain optionality. The smart move is to balance risk by exploring sourcing opportunities in countries that are not affected by the tariffs. In addition, in some areas, now is the time to negotiate the best possible deals on any raw materials, intermediate or finished goods that are not impacted by tariffs. For example, companies such as 3M and General Electric, which have diversified global supply chains, have expressed confidence in their ability to change their sourcing in response to cost increases. Gain market insights regarding shifting production facilities. Assessing the viability of shifting production facilities to avoid tariffs is a more medium-term strategy for executives to consider. For example, President Trump has suggested Apple Inc. should move its production from China to the US to avoid cost increases. Harley Davidson has shifted production for EU destinations from the US to its international facilities to avoid tariffs and Volkswagen group is taking advantage of its 122 factories worldwide to give it the ability to adapt to changing needs and requirements. Don’t let the grass grow under your feet. We suggest you waste no time in conducting a thorough assessment of your procurement, manufacturing and logistics functions to identify potential bottlenecks, increase optionality, release cash, reduce costs and achieve growth goals. If you would like to talk about any of the topics raised in this article, please contact Simon Knowles: sknowles@mainepointe.com, for a no-obligation discussion. In addition, in a rapidly changing tariffs landscape, it’s hard to stay up to date. Cut through the noise and stay abreast of the latest news, views and real-world impact stories on the tariffs pages of our website and sign up to receive our monthly ‘at a glance’ tariffs bulletin direct to your Inbox.